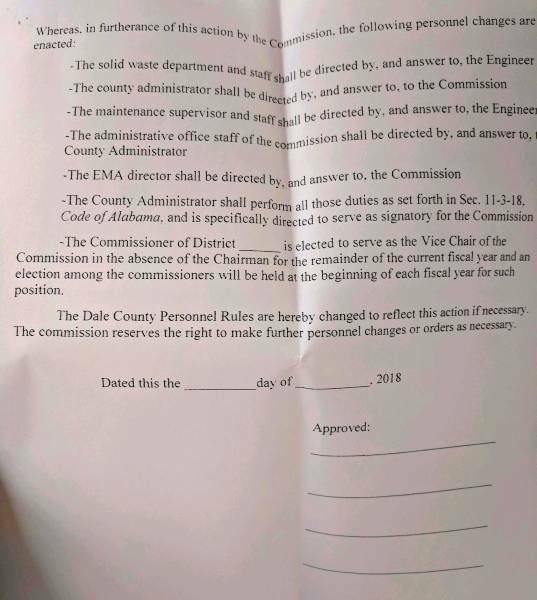 Dale County Commission Under Goes Realignment Today :: RickeyStokesNews.com! 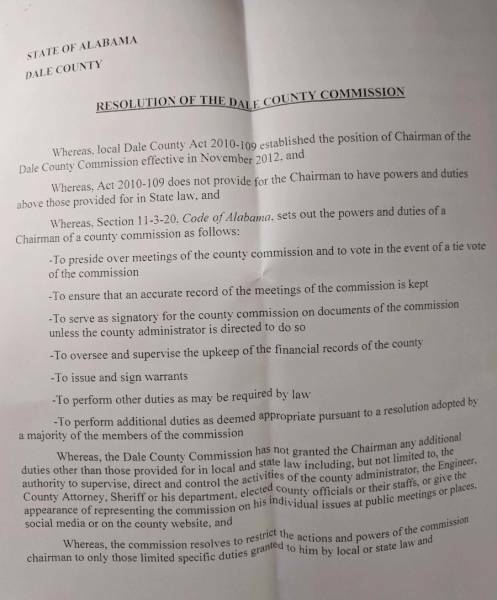 DALE COUNTY: This morning’s Dale County Commission Meeting started off like any other meeting, and then the Resolution was read and voted on. The resolution was basically removing some powers from the County Commission Chairman. 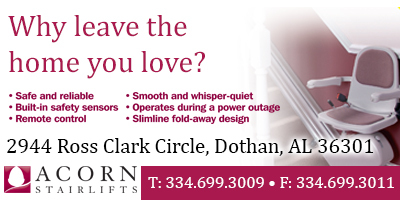 The Chairman (Mark Blankenship) has been stripped of any power or duties above what Alabama Law Requires. Below are copies of that resolution. Also District 4 Commissioner Frankie Wilson was voted to serve as Vice-Chair in the Chairman’s absents. The chair of the county commission shall preside over county commission meetings, provided however, the county commission may elect or authorize the chair to appoint a vice chair to serve in his or her absence. The chair shall only vote on a matter in the event that the votes cast by the other members of the commission are evenly divided on the issue except, when the chair serves on the county commission as a district commissioner, he or she may vote once on all matters that come before the county commission. (1) To ensure that an accurate record of all meetings is made and kept as required by Section 11-3-18 . (2) Except where the chief administrative officer has been directed to serve pursuant to subdivision (5) of Section 11-3-18 , to serve as signatory for the county commission on all appropriate documents, such as resolutions, orders, contracts, or directives, as are necessary to carry out the actions of the county commission. (3) To oversee and supervise the upkeep of the financial records of the county. (4) Except as provided in Section 11-8-9 , to issue and sign all warrants. (5) To perform other duties as required by law or determined appropriate by the county commission pursuant to resolution duly adopted by a majority of the members of the county commission.